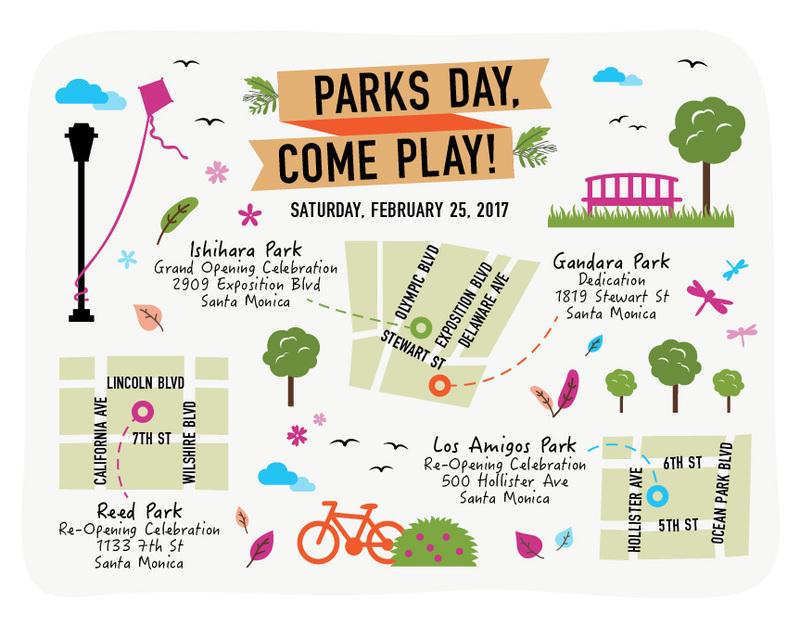 Join us at the City of Santa Monica’s “Parks Day!” this coming Saturday, February 25, 2017, 10am – 1pm for a special celebration of the importance of our city parks with family-friendly activities, refreshments, and entertainment varying at each of the four park locations. Airport2Park.org will be there to share updates about the new 12 acre Santa Monica Airport Park Expansion and recent news that the City of Santa Monica can now begin planning for the design and construction of a new Great Park to replace SMO when it closes on December 31 2028. The official “Parks Day!” event Ceremony will take place 10am at the new Ishihara Park located at 2909 Exposition Blvd. Santa Monica. Ishihara Park was named for George Ishihara, a long-time resident of Santa Monica’s Pico Neighborhood and a World War II veteran. Ishihara Park was designed by the prominent landscape architecture firm Mia Lehrer + Associates who will be conducting group tours at the new park. At 11:30 a.m.there will be a bike “Ride with the Mayor” from Gandara Park to Los Amigos Park. Bring your bike and helmet and join in the ride which will include Mayor Ted Winterer, City Manager Rick Cole, the Santa Monica Spoke bicycle advocacy group and Board Members of Airport2Park. * Gandara Park which will commemorate the official renaming and dedication of Stewart Street Park to Gandara Park. * Reed Park will celebrate the renovation of the northeast portion of the park. * Los Amigos Park will feature the completion of the Los Amigos Park Stormwater Harvesting and Direct Use Demonstration Project to reclaim stormwater runoff. “Parks Day!” is free and open to the public. Feel free to walk, bike and take the Big Blue Bus to take a tour of these great recreational facilities and to enjoy a great day in our City’s parks.